Each year in May, I travel to Washington, D.C. to attend a national conference with Mr. Wright and assist in lobbying our highest-level representatives on issues important to our economy and lives, such as: affordable housing, commercial real estate regulations which help establish businesses and jobs, infrastructure and mortgage concerns. It's dry material for those not genuinely passionate about it, but trust that professionals like my husband have your back in the nation's capital. We're typically so busy, running from meeting to meeting and event to event, I end up living on handfuls of nuts at receptions and dried bean soup, reconstituted with hot water from our hotel room coffeemaker. This year, I vowed to experience at least one REAL all-vegan meal, no matter how far I had to ride the Metro, how long it took, or what it cost. 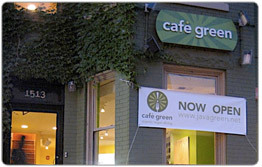 Fortunately, Cafe Green is located a short walk from the Dupont Circle Metro stop, provides effective service, and offered up a meal which even this mama-on-a-budget could swing. Mr. Wright and I had taken a fist-time conference attendee under our wings, promising to get her through the Capitol visits unscathed, and when I excused myself to go on my lunch adventure, she asked to join. "It's a vegan restaurant," I said. "So the food may be different than you're accustomed to." "That's okay," she said. I would later find out she didn't know what "vegan" was, but she really enjoyed the food. So, the three of us - our friend, Mr. Wright and me - jumped on the Metro and unloaded at Dupont Circle. From there, it was a few blocks to Cafe Green, an easily walk-able distance, even in the DC humidity. We were speedily and appropriately greeted upon entering, and - because the indoor seating was pretty full - offered a table outside. (I was secretly thrilled, because natural sunlight makes for better photos, and I need all the help I can get!) Although it was lunch time and she was busy, our server took our drink order quickly, and answered questions in a prompt and friendly manner. Due to our looming meeting time, we did ask to have all our food - salads, appetizers and main courses - delivered at the same time. Mr. Wright is not a fan of kale. ("But," I tell him, "Kale is a SUPER-FOOD!" No dice, though.) Still, he found the Mango Kale Salad tolerable, likely due to the massaging of the kale leaves with flax oil and a sweet dressing, making them tender, rather than that famous "woody" texture kale leaves tend to have. With its accompanying fresh mango, grape tomatoes and hemp seeds, I found the salad divine. I was a tad disappointed with presentation. Just a tad, not a lot. As you can see in the photo, the mango looks like it was hastily thrown on top, with its little mango "guts" trailing over the top of the salad. No biggie, and it didn't affect the flavor, which was delicious. There were a ton of fantastic-sounding appetizers on the menu, and I wanted to sample as many as possible, so we ordered the Starter Platter, which offered a trio of treats: Mini Mung Bean Pancakes, Mandoo Dumplings, and "bites" of their Chicken Che ciabatta sandwich. I want to preface what I'm about to say with a statement that everything on the plate tasted superb. I mean, just totally excellent. The dumplings were savory. The pancakes had a slightly "eggy" texture and flavor, and, in this case, that's a good thing. See more about the Che bites below, where I talk about the Chicken Che sandwich. However (and you knew the "however" was coming)... This appetizer completely lacked any visual appeal on presentation. Everything on the plate was in the same neutral color group, and no garnish was added for aesthetics. The trio of delicious sauces, served on a separate plate, were sloppily "sloshed" into the ramekins (see photo). Had I seen this dish on another patron's table, I would not be inclined to have ordered it, based upon appearance alone. I would have missed out on some fabulous nibbles, for sure, but presentation is a big deal to me, and food needs to be attractive when it comes out of the kitchen or off the line. Even just adding a kale leaf and a grape tomato or two (I know they have THOSE in the kitchen, for the salad, above) for the food to rest upon would have gone a long way toward dressing up this otherwise "beige" plate. This house-made patty is a blend of quinoa, lentils, and seven vegetables, including kale (SUPER-FOOD! ), served up with sauteed bell peppers, melty cheese, vegan mayo and standard burger-toppers like onion, lettuce and tomato. The sandwich is served with a side choice of chips or coleslaw, and I - a long-time 'slaw lover - opted for the red cabbage coleslaw, which proved to be a bit dry, but very flavorful with a robust, warm, spiciness to it. Instead of a traditional creamy vinegar base, this coleslaw tasted exotic, like ginger or cumin. My advice to the 'slaw maker would be to add some fresh grated carrot for a little more moisture. Otherwise, perfect! The burger itself held together well, and was a perfect blend of grains and vegetables. The whole wheat bun was hearty, and the presentation was adequate, but a little sloppy (see errant onion piece and toppled tomato slices). You already know I'm going to talk about the presentation, right? Again, we have a "beige" plate, with nothing but a pale pickle to give it any sort of visual flair - which is too bad, because this sandwich ROCKED. I'm not usually a fan of chicken analogs, but this ciabatta had so much more going on that I wasn't distracted by the "chicken." It was loaded with melted mozzarella, carmelized onions and a kickin' sauce. Finally, a presentation which did the awesome flavor of the menu item justice! Look at that perfectly sweet display of chocolate, and blueberry accents! The Raw Fudge Bar, made with raw cacao, avocado, coconut nectar and nuts, sported a rich, creamy topping and a chewy, nutty texture to die for. It's also available nut-free, made with sunflower seeds. Overall, I give Cafe Green a big thumbs-up, in spite of the lackluster presentation on some of the dishes. The service was friendly and timely, the food was delicious, and the menu offers a fab selection of all-vegan, organic options at a reasonable price. I know I'll be visiting again next year, when May rolls around. Happy dining!